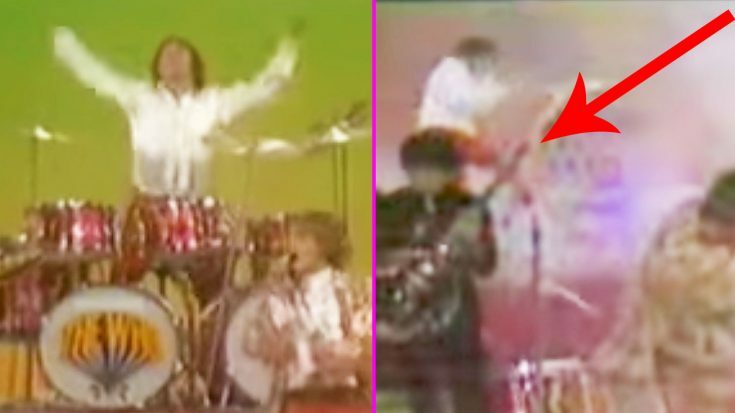 Remembering The Iconic Moment Where Keith Moon’s Explosive Drum Solo Turned Into An Actual Explosion! Today we remember the great Keith Moon! Keith was one of the most energetic figures in the history of rock music, and his performances always seemed to mirror his wild and hectic lifestyle. Moon, and The Who in general, were known for their crazy on stage antics which included smashing instruments, inciting riots and destroying the entire stage. But one moment stands out among the rest. During the band’s 1967 television performance on Smothers Brothers’ Comedy Hour, the band turned an explosive performance into an actual explosion! The band planned on smashing their instruments and ending their set with Keith blowing up his drum set. The band had done it numerous times before, but this time Keith snuck 10x the amount on gunpowder and cherry bombs in his kit and caused an explosion that surprised him, the audience, the band and the TV hosts. He didn’t know it would cause that much of a ruckus, and completely underestimated the amount he put in! The explosion knocked him back, and could have seriously hurt, or even killed Keith. But luckily, it turned out okay in the end. Check out the iconic moment down below and let us know what you think!